TECHNICIANS!!! 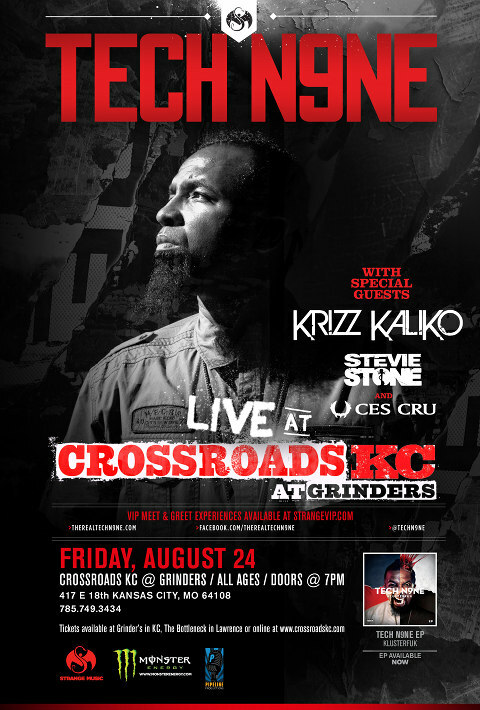 We’re pleased to announce that we’re offering a limited number of Meet & Greet VIP Experiences to all of you who want to experience the KC Crossroads Tech N9ne performance on Friday, 8/24 as a VIP! For $85 plus shipping you can roll like a VIP – you’ll get complimentary admission with front of line access to the KC Crossroads show on 8/24, a Meet & Greet with the artists, a limited edition VIP shirt (XL only) and a mystery Strange Music silicone bracelet! Don’t miss your chance to experience the hottest show in KCMO – VIP style! Click here to order your KC Crossroads Meet & Greet VIP Experience now! PLEASE NOTE: this VIP Experience DOES NOT include any merchandise other than a limited edition t-shirt and a mystery Strange Music silicone bracelet. You will ONLY be shipped the limited edition VIP shirt (XL only) and the silicone bracelet! Your VIP pass and ticket WILL NOT be mailed to you – you will receive those when you arrive for the Meet & Greet on the day of the show!